Today’s ride was a special one. Out to West L.A. to Hillside Memorial Park to visit Moe Howard’s grave. We met at Victory Park and headed out. The route there was pretty easy, since it’s mostly downhill all the way to downtown L.A. On the way through downtown, we saw the new Caltrans building on 1st St. It looks like it was designed by the same architect as the Death Star. 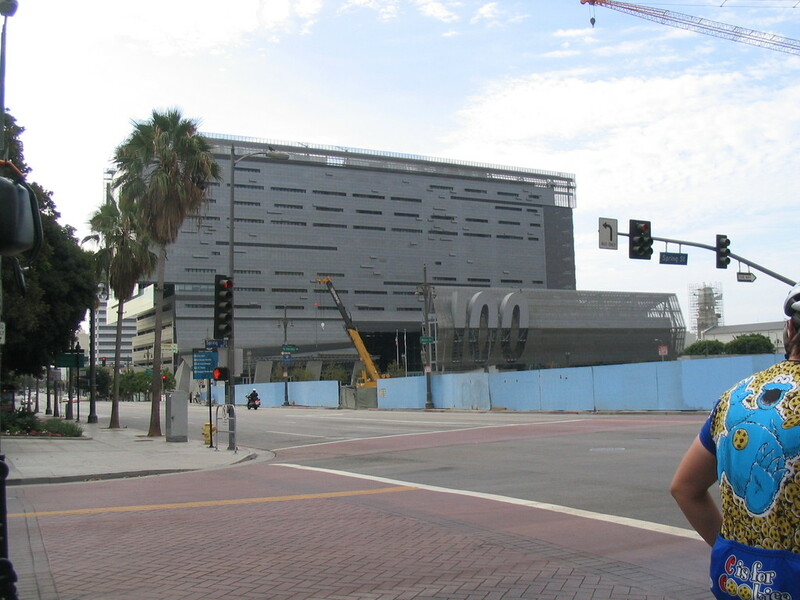 On the south side of downtown, we saw the Metro Blue Line train heading to Long Beach. 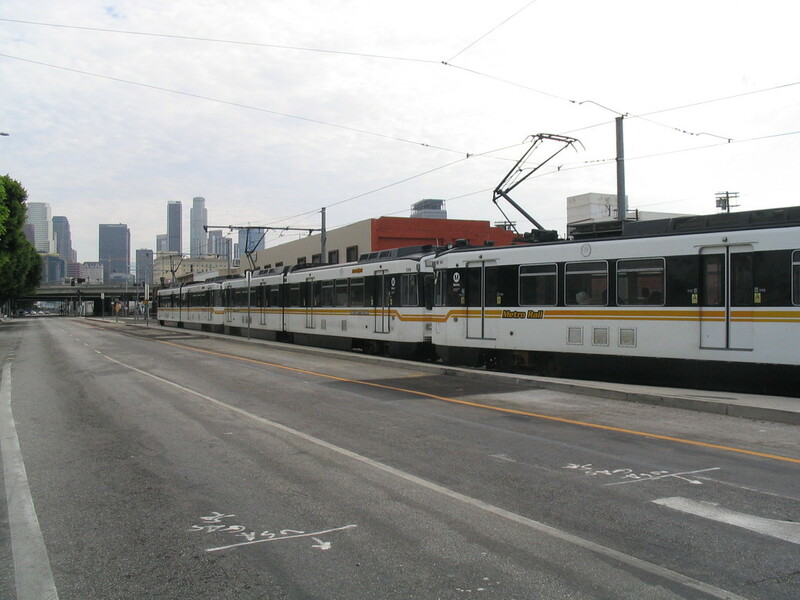 The Blue Line is one of the success stories for rail in Los Angeles. It’s about the only rail line that’s used by lots of people. Next, we headed straight west on Adams. 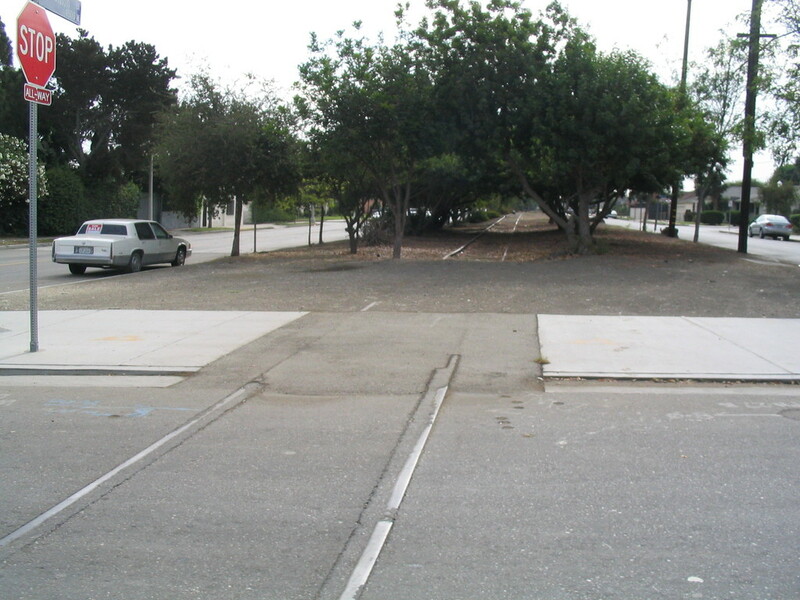 Then we cut south, crossing the old rail line that is going to be the Metro Expo Line someday. The old tracks are still there, but it’s pretty obvious that there hasn’t been a train on them in decades. At La Cienega, we saw the little piece of freeway that they built back in the 1950s. It was supposed to be the first part of the Laurel Canyon Freeway, and it was supposed to run all the way up to North Hollywood. We rode through Culver City and passed Fox Hills Mall. Then we were there. The guy at the gate didn’t want to let us in for some reason. I really have no idea what he thought we were going to do. If we’d been in a car he wouldn’t have even noticed us. But I explained that we were there to visit with Moe Howard, and I showed him the map and my handwritten directions. So he finally let us in. We rode up to the top to look for Ruth Handler’s grave, but we weren’t able to find it. Then we headed over to see Vic Morrow. His death in the “Twilight Zone” movie was the big news story when I first moved to L.A. back in 1982. Finally, we headed back down to find Moe. The directions I had were not very good. They said he was in the “Court of Love”, but he and his wife Helen were actually in the “Alcove of Love” right next to it. Anyway, we found Moe and took a moment to reflect on The Three Stooges. We’d visited Curly Howard’s grave, which makes no reference to his time with the Stooges. But we noticed that Moe’s was marked with his stage name. He lived long enough to see the Stooges become legend. Benton Way ends in a steep uphill pitch. 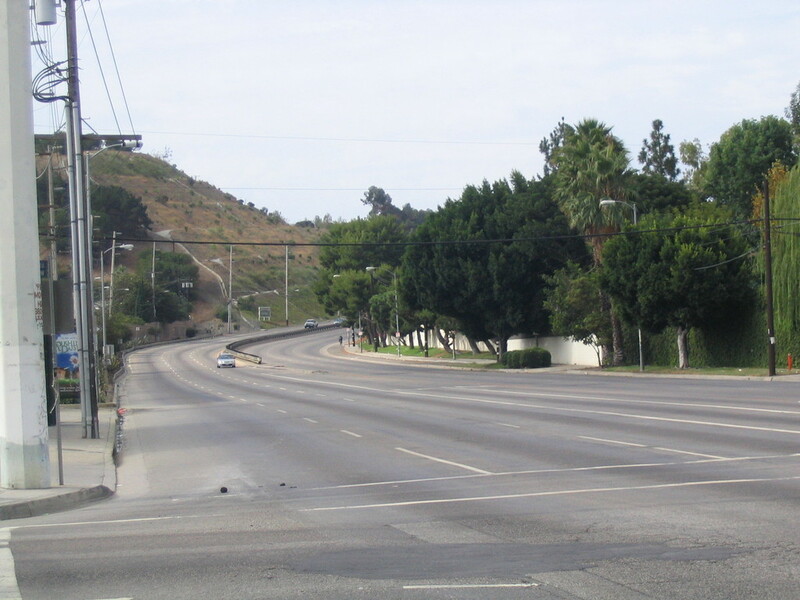 Then we take a couple of small streets and come out on Silver Lake Blvd at the top of the hill by the dog park. From there, we took the regular route home on Eagle Rock, Ave 50 and Monterey Road. 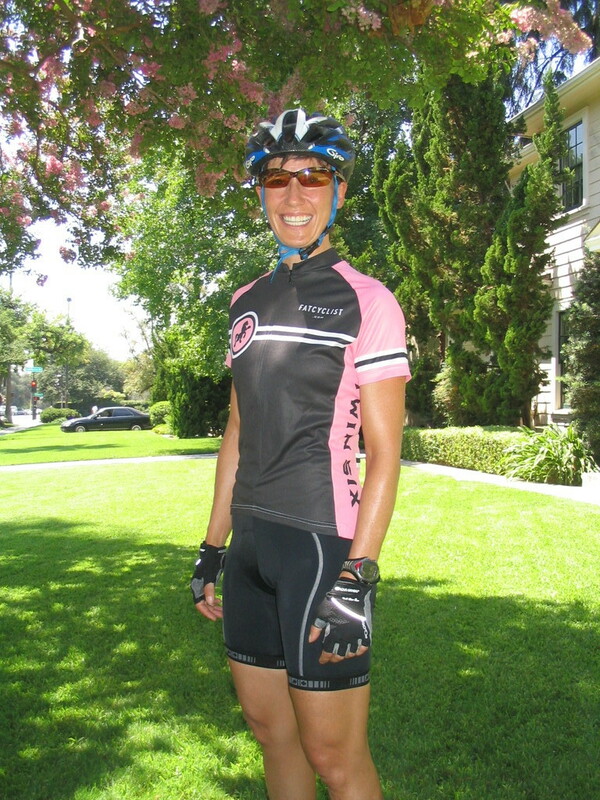 I did the Foothill Cycle Saturday ride today. The route was the “Crown City Trainer”, which was basically a ride to nowhere in particular, but going up and down every hill around. It was fun. It’s the story of a man named Louis who was a pioneer in the field of body and genital piercing. Reading the story, I realized that we had met him once. Back in 1988, we went to a video show and party at EZTV in West Hollywood. And we met him. He was a nice guy. But when I got to the surprise ending of the story, I just about fell out of my chair. 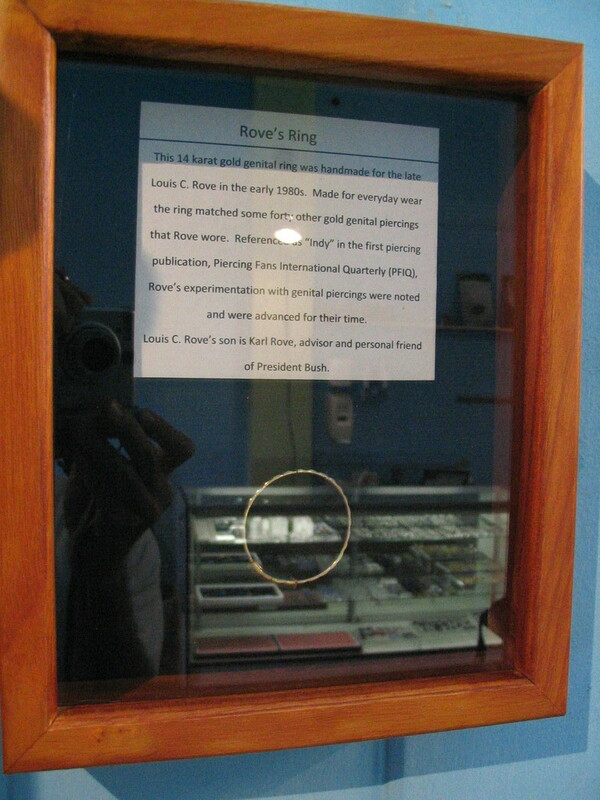 After reading the article, I heard that one of his old rings is on display at Anomaly Piercing here in Pasadena. So I stopped by on my way home to see it. In the kink world it’s sometimes said that the weirdest people are Republicans. August 21, 1977 was the day that I finally made Category 2. 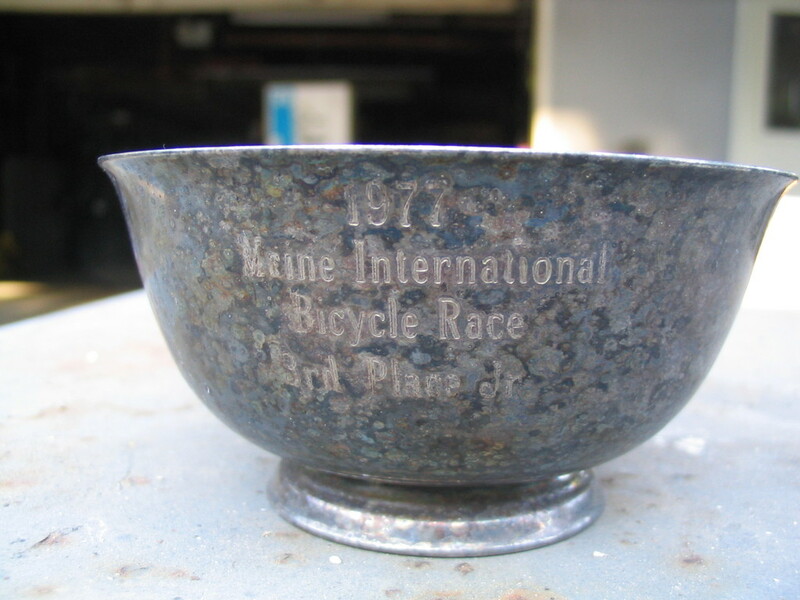 The race was in Waterville, Maine. It was the finish line the Maine International Bicycle Race, which was a rarity in that it was a true point-to-point road race. It began near the Canadian border and traveled south for 100-mumble miles to the finish in Waterville. But because just watching a pack of sweaty bike riders roll into town and sprint for the finish isn’t terribly exciting for the locals, the organizers also held a Junior race in town for the spectators. The race was a criterium around downtown Waterville, and it was 25 miles, which was long for a Junior race. Most were 10-15 miles. So I wanted to ride it, since I usually did better in longer races. I got the use of the car for the weekend and set out looking for some other riders to come along. My friend Cary wanted to go. Unfortunately, he didn’t have a driver’s license. It was about a seven-hour drive from New Jersey in those days with the 55mph speed limit, and I wanted to find someone who could share the driving. So my other friend Gene came in. He had his learner’s permit, which meant he could drive if another licensed driver (me) was in the car. So this was good enough for us. And it’s probably best that we never stopped to think whether or not this was also going to be legal in the five other states we would be passing through to get there. So Gene and Cary came to my house and we loaded up the car. Two bikes went on the roof rack, and the third was stuffed under the hatchback. With all our stuff, there was barely room for the three of us in the car. The ride up to Maine was pretty uneventful. When we got there, it was night, and we went looking for a place to stay. We picked a motel and Gene and I went in to see about getting a room. The manager was suspicious, and kept asking us if we had any girls with us. We told him we were there for the bike race, and pointed to the car outside with the bikes on the roof. So he let us have a room. We unloaded the car and started getting our bikes ready for the race when there was a knock on the door. The manager had decided to come and check again to see if we had any girls with us. Since we’d told him that there were just two of us, Cary grabbed his bike and went to stand in the shower with it while the manager came in. He looked at the bikes, wheels, and racing clothes strewn around the room and he was satisfied. Our next priority was finding something to eat. Cary wanted to have something good, and not fast food. So we ended up at the only ‘nice’ restaurant in sight. The Silent Woman was the place, and we looked pretty out-of-place in there. It was all adults and families, and a trio of teenage boys looked pretty odd there. But the food was good, so we were happy. The last priority was deciding how to divvy up the two beds. As you might imagine, this was a gravely important task for teenage boys. We drew lots, and I won. So I got a bed to myself while the other guys had to share. In the morning, we headed over to the race. The course was pretty nice. It was basically triangular, with two long straights and a wide hairpin turn at one end. There was a slight grade, but nothing worth getting excited about. There was also a tremendous hole in the road that was marked off with sawhorses and cones. The race had a pretty good turnout, and the pack stayed together for about half the race. Then a breakaway formed. I don’t remember how it started, but I managed to get in it. There were three of us, and we got a good lead on the pack. We managed to stay away to the finish, and I didn’t even contest the final sprint. So I came in third, which was the finish that put me over the top for my Category 2 upgrade. My goal for the year had been to make Category 2. I had one first-place finish, a fourth-place finish, sixth place in Rahway in July, and sixth place in Pittsburgh. So with this third place finish I met the requirements for my upgrade. That was the thing I was most excited about. My actual prize for the day was a pair of pedals and a little silver-plate trophy bowl. I used the pedals for many years until they broke from metal fatigue. But I still have the little bowl. And the memories of that day. It was a fun time. 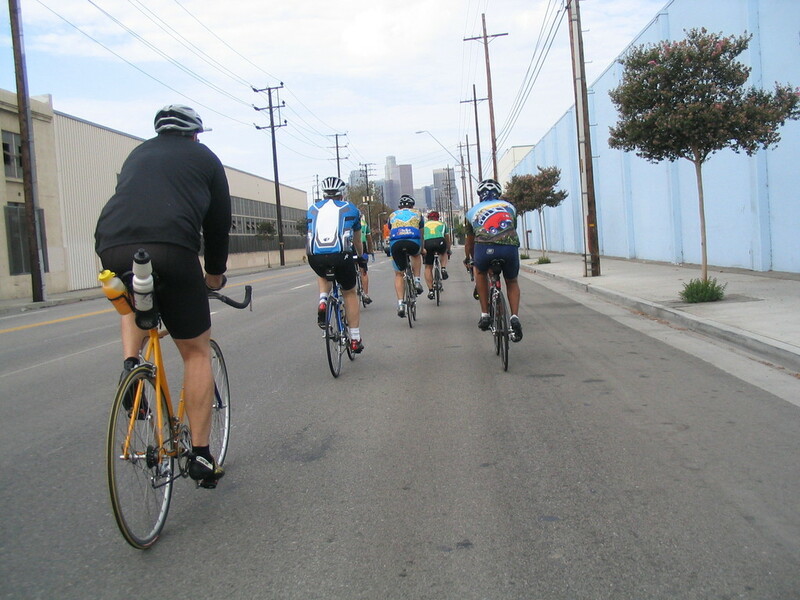 Today’s ride was the Toluca Lake Inverse route, which is basically the same as the regular route, but done backwards. Things always look different when you’re going the other way. 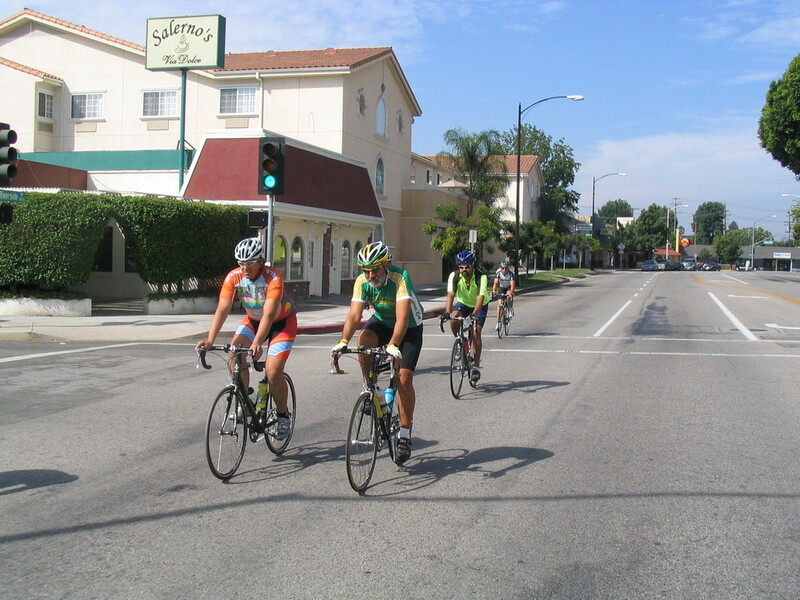 We started out going south into San Marino, and then across South Pasadena and into Highland Park. I saw a pair of abandoned couches on Ave 50. The Los Angeles River had a lot of water in it today. Especially for August in the driest recorded year ever. It’s not clear where the water is coming from, but it may be runoff from lawn watering. Whatever it was, it looked weird to see that much water going down the river. When we got to Priscilla’s, we got our usual snacks and drinks. It was nice in the shade there. Coming home, we did the route across Glendale on Glenoaks, and then up Verdugo to Hospital Hill. Then home by the usual route on Woodbury and New York Drive. I got a chance to do two rides this weekend, so the Saturday ride was out to La Verne and back. We met at Library Park in Monrovia and headed east from there. 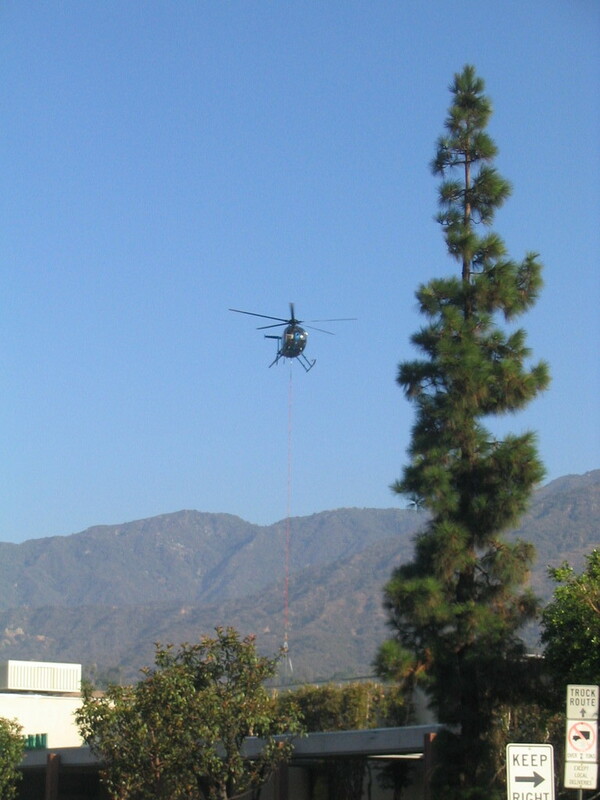 In Duarte, we were treated to the sight of a helicopter being used as a crane. It was lifting a series of large boxes from the parking lot up to the roof of the building. We rode pretty much straight east, all the way across Glendora and San Dimas, where we turned and rode up San Dimas Canyon Road. Then we made a loop up in the hills, coming out right next to Live Oak Reservoir. I’d never seen it in daylight before, but I recognized it immediately. 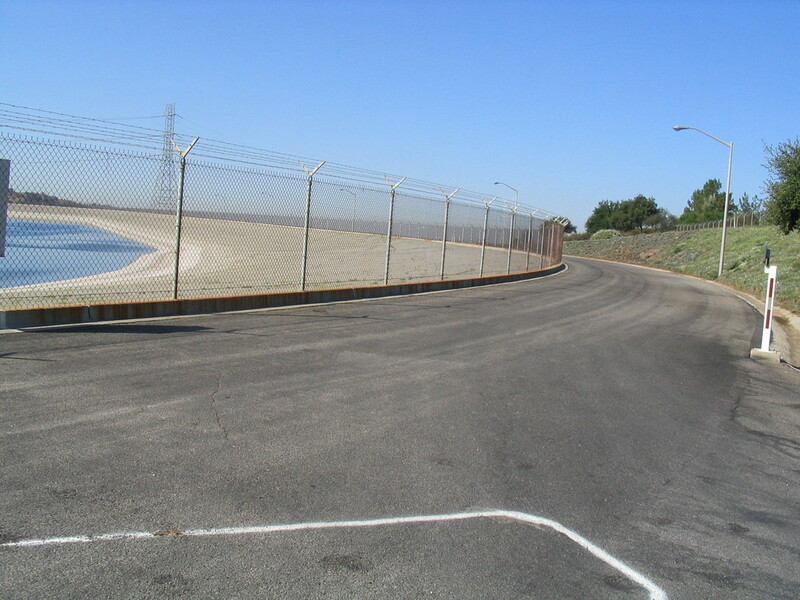 Back in 1978, when I raced with the Claremont cycling team, we used to to evening workouts on the road around that reservoir. We rode our track bikes, and we did intervals, time trials, and practice races. The thing I always remember about those times was how our coach, Steve, used to ride with us. When we got going fast, he always looked like he was going to die. His face was red, and he was sweating hard. But he always beat us in the final sprint. He had ridden on the 1968 Olympic team, so he was actually a very good rider. After passing the reservoir, we dropped down a very steep hill. Gene said that he got up to just over 48mph on it. 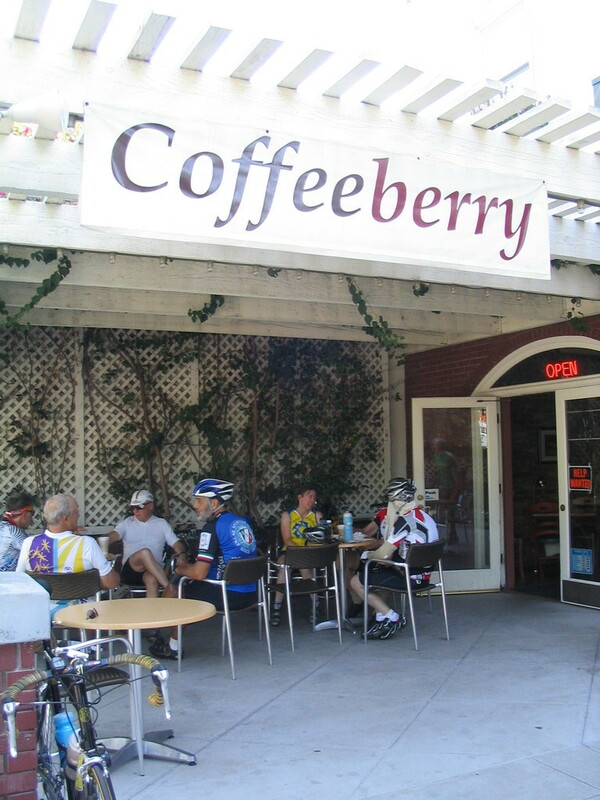 Then we rode into La Verne and stopped in the nicely shaded patio at Coffeeberry. On the way back, we took the direct way. It was very hot by then, so we stopped for water several times. 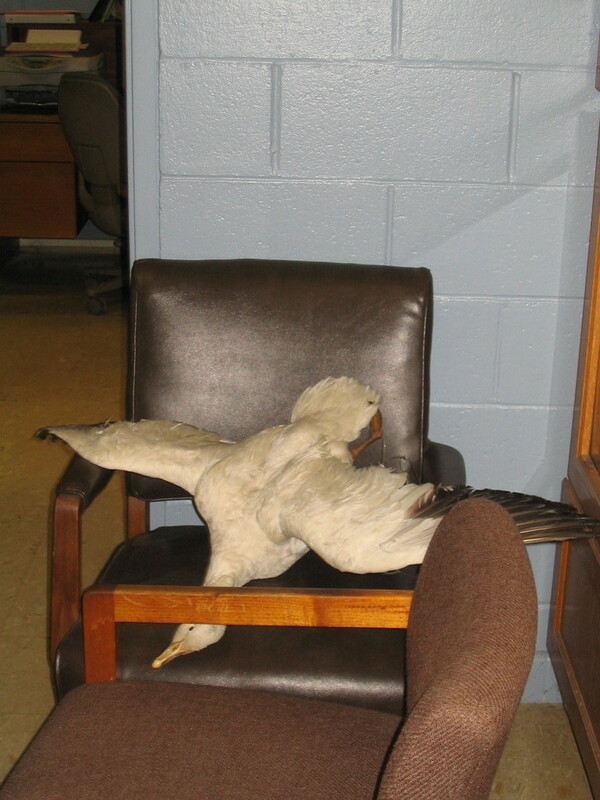 At the Santa Fe Dam Nature Center, we saw a number of oddly-placed stuffed birds. There was also a stuffed bobcat. Outside, we saw a roadrunner go by, so not all the birds there were dead and stuffed. 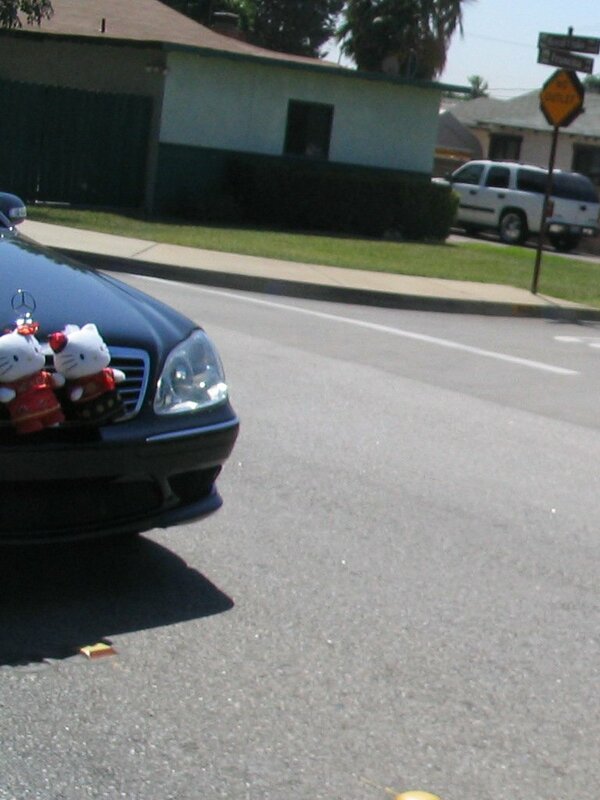 The last funny thing we saw was the car in Duarte with the two Hello Kitty dolls strapped to the front like so many dead deer. It was an amusing and fun ride. Those trees next to the track are a lot bigger now, nearly 30 years later. Since I was back in the office on Wednesday, I went for a bike ride with Vikki at lunchtime. She was decked out in her new pink Fat Cyclist jersey. It was hot, and we did the Arcadia loop, since that’s a relatively flat and easy ride. Nothing remarkable happened, aside from seeing a pair of deer on the road in Sierra Madre, and the fact that I got a flat right after that. Tuesday was the last day of our trip, and I had one more thing on my list to see. Since I had to be in New Jersey, I couldn’t miss the chance to visit Hillside Cemetery in Lyndhurst and pay respects to Joey Ramone. I’ve been a big Ramones fan for almost 30 years, so it was a necessary stop. Chelsea* directed us to the cemetery. Then I stopped in the office to get the exact directions. The woman working there was very helpful, and she said that Joey Ramone was probably the most famous and most-requested person buried there. She told me to go to the northernmost road through the Jewish section of the cemetery. Then look for the two pillars marked “New York Social Club”. Joey is buried three rows back in that section, right next to his mother. After that, we went down to Liberty State Park in Jersey City. Since we’d missed the Statue of Liberty on Monday, I found out that we could just make it there if we made the 12:45 boat out to the island. So we got on the boat and rode out to the statue. We didn’t have time to stop off at Ellis Island, since we had to make our flight home at 6:00. But Lucinda got to see the statue close-up, which was the whole point. When we got back to shore, we headed over to the airport. We got there early to check in our rental car, since we’d been told we’d have to fill out an accident report. The guy who checked us in looked at the car and just said something like, “it looks fine to me” and we were done. So we had plenty of time to have lunch while we were waiting. Then we got on the plane for the trip home. Newark is apparently notorious for delays around that time of day, and today was no exception. We left the gate about 30 minutes late, and we actually took off 90 minutes late. There was a huge backlog of planes that apparently were all scheduled to take off at 6:00. Once we got in the air, the trip home was just fine. When we were going over New Mexico and Arizona, there were some big electrical storms below us, and it was interesting to watch the lightning from above. I tried taking pictures of it, but it was hard to do it justice. Overall, it was a pretty fun trip. * The GPS navigator unit offered a choice of several different voices. But Lucinda didn’t like the ‘American English’ one, since when it said ‘left’, it always sounded like ‘bleft’. So we switched it to ‘British English’, which sounded much more cultured and mannered. And that was when Lucinda decided to call it ‘Chelsea’. Monday was our day for sightseeing New York City. We rode the train in and met Cathy’s cousin Michelle and her family at Penn Station. Then we all rode the F train up to 63rd St and Lexingon, and then walked over to Central Park. When we got to the park, Lucinda wanted to climb the big outcrops of Manhattan Schist there. Since we had only limited time, I wanted to go to the model boat pond to show Lucinda the statue of Alice in Wonderland there. I used to like climbing on that when I was a kid, so I thought she might like it, too. Lucinda figured this out. When we were going there, when I told her about the statue and how I liked to climb on it, she said, “So you want me to climb it so you can take a picture, right?” Our child is very perceptive. After seeing the pond, Lucinda and Christina wanted to go to one of the playgrounds for a while. Then we walked back to Lexington Ave and got on the #6 train downtown to Grand Central. Then we took the shuttle train over to Times Square and then the #1 down to South Ferry. That’s the station that is built on a sharp curve, so there are little hydraulically-activated metal platforms that move out to meet the train doors. When we got up to Battery Park, we found that we were too late for the ferry to the Statue of Liberty. So we just walked around the park a bit. We saw a wild turkey there. Apparently, there is a population of wild turkeys living in Manhattan now. We thought that this was kind of strange, but after seeing the bear in New Jersey, we were ready to believe just about anything. Since turkeys are not good fliers, the speculation is that they walked in over one of the bridges, which is a funny mental image. The final stop for the day was the East Village to visit with my old friend Thaddeus. I’ve known him for about 35 years now, ever since my mother was his high-school guidance counselor. And somehow, we’ve kept in touch all these years. This was the first time I’ve seen him in many years, so we got to meet his wife and daughter for the first time. We all went out to dinner at a little Latin American restaurant across the street from their house. I was amazed at how the neighborhood along Houston St has changed over the years. I always remember it as being a place where there were groups of homeless huddled for warmth around flaming trash cans. Now it’s really quite nice there. So, aside from missing the Statue of Liberty, we had a nice day. Finally, I have a photo from the pond in Central Park. It’s my latest Canon commercial. Have I mentioned recently that my camera rocks?